The laundry room is often overlooked when it's time to sell a home. Proper staging can turn an often dull and scary area into an asset. Everyone must do laundry and having a bright, clean, pleasant space is just another reason for someone to buy your home. Check out the real estate listings in any city. Whether you're looking at a starter single family home or high-rise co-op, you'll see that an available laundry room is prominently mentioned for most home and condo sales. Why? Buyers want a laundry room. Americans do, on average, more than 400 loads of laundry each year. Since buying a home is a big investment, we want to be able to do that laundry in our home. Today's buyers are looking for a specific room dedicated to laundry chores. And they want it to be functional and attractive. In a recently released survey of 3, 682 home buyers “What Home Buyers Really Want” conducted by the National Association of Home Builders (NAHB), ninety-three percent state that they want a laundry room. Of those who wanted a laundry room, fifty-seven percent considered it essential and would not buy a home that didn’t have one. Chalk up the need for a convenient laundry room to our busy lives and the need to multi-task. Finding time to head to a laundromat or community laundry room is difficult. Energy efficiency in home appliances is actually the most listed request - with Energy Star rated appliances ranked number one along with high-efficiency windows and insulation. As a major area of energy consumption - water and electricity or gas - laundry appliances are an important feature. 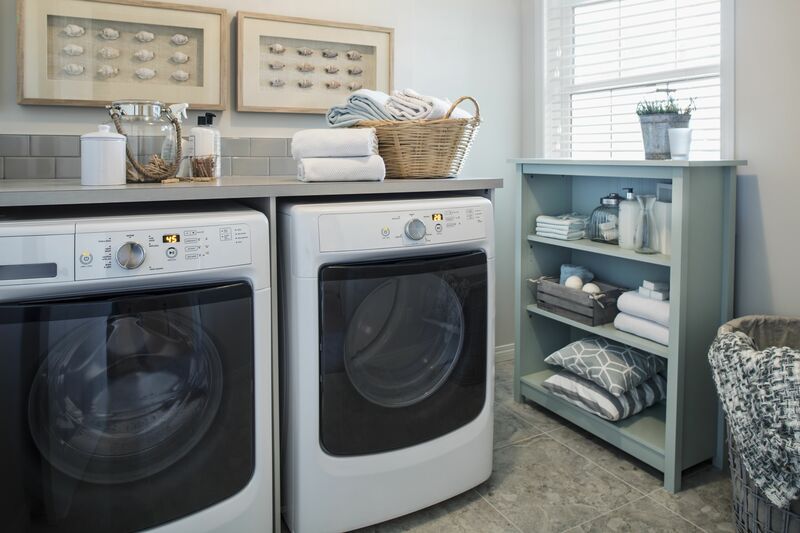 In nearly every location preference, the key is a workable, separate laundry space so that noise from the washer and dryer are limited and dirty clothes are concealed. And, a space with plenty of storage and a spot to organize daily household chores. Home buyers are requesting a space that not only houses the washer and dryer but has a deep laundry sink that can be used for soaking clothes, washing the dog and cleaning up after hobbies like gardening and painting. They also want a multitasking room that is part mudroom, coat closet, craft center and locker room. If the laundry area is large enough to house other activities, it is most often located adjacent to the garage. Most homeowners enter and exit through the garage and having the expanded laundry room there helps to streamline clean-up and organization. Allowing kids and adults to drop off dirty clothes before they get scattered around the home makes laundry chores easier. Need Ideas For Staging Your Laundry Room? With just seven steps, you can stage your laundry area so that a buyer will be ready to make an offer. If your laundry area is part of a finished or unfinished basement or garage, make sure a specific area is for laundry only. Even if the space is used for storage or another use, the laundry area should sparkle as much as your clean clothes. Discard or store off-site anything that does not a specific use in the laundry area. Every real estate agent will tell you that your home must be clean for potential buyers and that includes the laundry room. Take time to wipe down your washer and dryer to make them look shiny and well cared for. You might even want to give them a new coat of paint. If your washer has an unpleasant odor, clean the machine so that buyers won't be concerned that the smell is permanent in the home. Vacuum up any lint around the dryer and clean any traveling dust bunnies. Wipe up detergent spills. If you are still doing laundry while showing your home, don't leave piles of dirty or clean laundry in the space. No one wants to see that! A coat of fresh paint and a new light fixture with plenty of wattage will easily brighten up the laundry area. Consider painting an area of the concrete floor in an unfinished basement to designate the laundry space. I'll bet we all can find some laundry product bottles that are outdated or empty. Throw them away. Put detergent and other laundering supplies in storage cabinets. If you don't have cupboards, inexpensive shelving can look great with attractive canisters or baskets. If there's a window with a drab view, hide it with a curtain or a nice blind that is light enough to allow some light to pass through it. Add a framed picture or a plant to make the area more attractive. Take a moment to clean the outside vent from your dryer. Loads of lint hanging from the vent does not speak to a well cared for home. If you have an outdoor clothesline, be sure it looks neat and usable - no rust, no sagging. What Are the Necessary Specifications for a Laundry Room?